Victorinox should be a brand that is familiar to any knife aficionados as they are behind the creation of the original Swiss Army Knife. 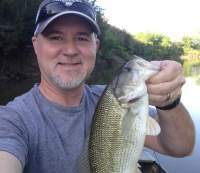 While you are more likely to find their knives in a chef's kitchen, there's nothing preventing you from taking one along on your next fishing trip to make easy work of preparing your catch. This boning knife features a National Sanitary Foundation approved Fibrox Pro handle, which has been designed to minimize wrist tension. The grip of the handle is also very comfortable and sturdy. When it comes to the blade, this knife has a high-carbon stainless steel construction that has been conically ground in order to maximize its sharpness. The result is a knife that is not just very sharp, but also enables you to use it securely and with precision. Since the blade is very flexible, it is ideal for fish and you have a lot of maneuverability around bones. The ergonomic design of the Fibrox Pro handle results in a comfortable grip no matter what size your hands are and it is also non-slip, which reduces the chances of accidents. Because the handle is textured, it feels secure in your hands, even if it does get wet or covered in fish slime. In addition, this fillet knife is very lightweight, so it won't weigh you down. 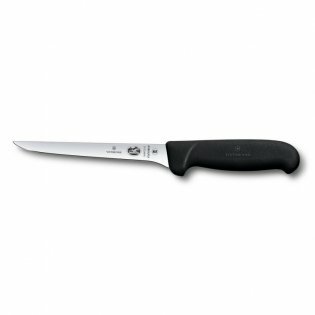 If you are looking for a fillet knife that will be just as useful during your next fishing trip as it is in your home kitchen, then you can't go wrong with the Victorinox 6-Inch Flex Boning Knife. It has a solid reputation and a proven track record of delivering exactly what it promises. There are better options available if you are looking for a fillet knife that is specifically designed for the outdoors and kayak fishing, but the versatility of this knife still makes it a good choice.